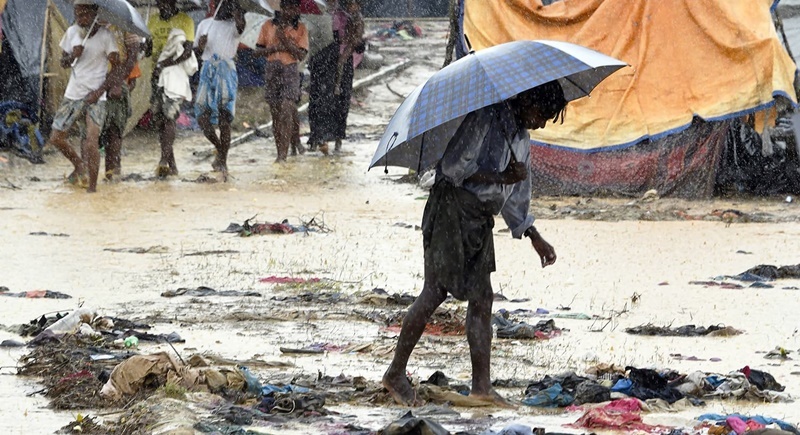 BANGLADESH: Heavy monsoon rain heaped new misery yesterday (Sept 17) on hundreds of thousands of Muslim Rohinyga stuck in makeshift camps in Bangladesh after fleeing violence in Myanmar, as authorities started a drive to force them to a new site. With food and water shortages already making life tough, torrential rain brought back swamp-like conditions to many parts of the border town of Cox’s Bazar which has become a magnet for the Rohingya. About 7.7 centimetres of rain fell in 24 hours and more is predicted in the next two days, the Bangladesh Weather Department said. Bangladesh authorities, who have already issued travel restrictions on the Rohingya, launched an operation late Saturday (Sept 16) to get tens of thousands out of roadside camps and hillside shanties into a giant new camp. The United Nations says 409,000 Rohingyas have now overwhelmed Cox’s Bazar since August 25 when the military in Buddhist-majority Myanmar launched operations in Rakhine state. Police toured streets with loudspeakers ordering exhausted families to go to the Balukhali camp in Cox’s Bazar, which is being cleared to build new shelters. “We are shifting them from the roadsides where many of them have been staying,” Khaled Mahmud, a government spokesman for Cox's Bazar district said. But the United Nations is already warning of intolerable conditions in the camps around Cox’s Bazar. The rain “has doubled their misery”, said Mohammed Kai-Kislu, police chief at Ukhia near Cox’s Bazar, the new home for many Rohingya. “They evicted us from the rubber plantation,” she said, referring to the police and border guards forcing the refugees out of makeshift shelters. Faced with a spreading mud bath, the Rohingya have started building bamboo carpets to get over flooded land. A human rights expert in Cox’s Bazar urged the government to shut local schools for three days to allow the Rohingya to camp in them. “It is another disaster unfolding. Thousands of Rohingya had no place to hide when the rain came,” Nur Khan Liton, who headed Bangladeshi rights group Ain O Salish Kendra, said. Myanmar’s de-facto leader, Aung San Suu Kyi is to give a nationally televised speech on the Rohingya case tomorrow (Sept 19). General Min Aung Hlaing, Myanmar’s globe-trotting army chief, called for a “united” stance in handling the crisis but gave no sign of concessions. She is to address the UN assembly on Thursday (Sept 21).